Plenty of groups have pushed the city—and its residents—to reconsider how we think about the river. Last year, the city briefly opened a 2.5-mile stretch in Elysian Valley for public recreation, finally allowing people to bird watch, fish, and freely roam the area. From Memorial Day to Labor Day, visitors could book a guided tour and explore the river via kayak. Whether you were a pro or newbie, you simply had to get a permit when kayaking with an organized group. The 2013 test run proved so successful that this year, the program has returned—and it’s bigger and better. In addition to kayaking through Elysian Valley, you can now glide down Sepulveda Basin, a shorter and calmer stretch better suited for the casual paddler. 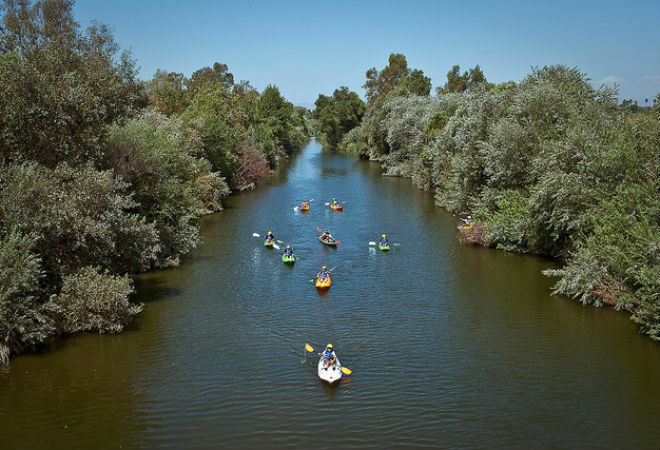 Friends of the Los Angeles River (FoLAR) and LA River Kayak Safari will together host several events and tours that will give participants a glimpse of the local landmark. Tickets went on sale on May 25 and, according to FoLAR’s co-founder Steven Appleton, more than 50% of last year’s business booked up in the first 18 hours. Like last summer, you can kayak from dusk to dawn between now and Labor Day weekend. You don’t need a permit to kayak on your own, you just have to enter the river at the designated put-in point (south of the Fletcher Drive bridge along the L.A. River Bike and Walking trail) and exit at the take-out point (near Oso park). If you’re kayaking the river on your own or with friends, bring your vessel, your paddle, and a lifejacket, which is required. A helmet is strongly recommended. Rather go on a guided tour? Book an organized trip with LA River Kayak Safari. The tours generally last three and a half hours, cost $70 for minors and $75 for adults, and happen seven days a week at 3:45 p.m. with additional 8 a.m. tours on weekends. As long as you’re over 10 years old, weigh under 210 pounds, and are in good health, you’re all set. Last year’s permit policy remains in effect, meaning that permits are only necessary for groups that are hosting events or programs or providing services along the river. To obtain a permit, you’ll need to fill out an application on the Los Angeles River Recreation website and email it to lariverrecreation@mrca.ca.gov at least five days before your trip. Permits cost $75 to $375 per day depending on the applicant and the event. Next articleCana Rum Bar Asks: Piña Colada, Blended or Shaken?